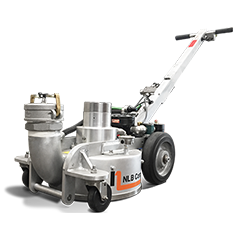 NLB’s new vacuum system is designed to provide a small, lightweight vacuum source for use with our HydroPrep® line of water jet surface preparation tools. The system’s small footprint and lightweight design allows it to be mounted in the bed of a one-ton truck, effectively turning any pickup truck into a vac truck. 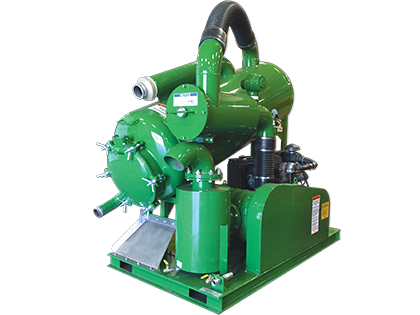 The vac system is driven by a 44 HP (33 kw) diesel engine and provides 1,000 CFM @ 6″ to 8″ of mercury. A 220-gallon tank collects all waste and debris. 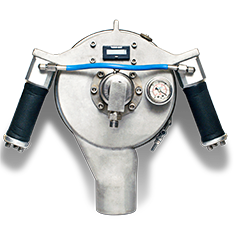 A side-mounted port allows for the water to be drawn off with the included solid handling pump. The standard mounting package includes a skid with forklift slots and lifting lugs. Provides 1000 CFM @ 6″ to 8″ of vacuum. 220 gallon (833 l)angled debris tank with a six-lug zero-leak hatch. 44 HP (33 kw) Deutz diesel engine. Remote filter housing allows easy access to the one-piece 10 micron washable filter element. 2-part epoxy paint system on both the tank and skid. Integrated blower silencing system for quiet operation. Fits into a 4′ X 8′ (1.22 x 2.44) space and weighs only 2000 pounds (908 kg). Remove and recover coatings from large vertical surfaces. Hand held semi-automated tool allows for full recovery. Quickly remove coatings from horizontal surfaces.